This year’s winner of ‘The World’s Best Bar’ award is an old London classic, but says it’s still learning new tricks to stay relevant. Whilst aged spirits sit on the art deco shelves of the Savoy Hotel’s American Bar, the barmen aren’t remaining rooted in the past. In the late 19th and early 20th century, as transatlantic travel became more popular and affordable, many so-called ‘American Bars’ popped up across UK’s capital. They served what were at the time described as “American-style” drinks. Today, they’re simply known as cocktails. The Savoy Hotel’s American Bar is claimed to be the longest surviving of those bars. But rather than clinging on to the past, bartenders here continue to experiment with different spirits, styles and flavours. Its current cocktail menu – named ‘Coast to Coast’ – whisks guests on a liquid journey across Britain, exploring its unique ingredients and nuanced flavours. It takes inspiration from the Garden of England, Art Deco London, Sherwood Forest and Edinburgh. “It was all about chefs, all about food and not much about bars,” says head bartender Erik Lorincz. Recently, the American Bar was honoured for its unique experience. It was named ‘World’s Best Bar’ in an annual list of the top 50, having received the most votes from over 500 industry experts. “The bar landscape is always changing,” explains William Drew, group editor at The World’s 50 Best Bars. “People want an experience always, but they don’t necessarily want the same experience rectified everywhere. 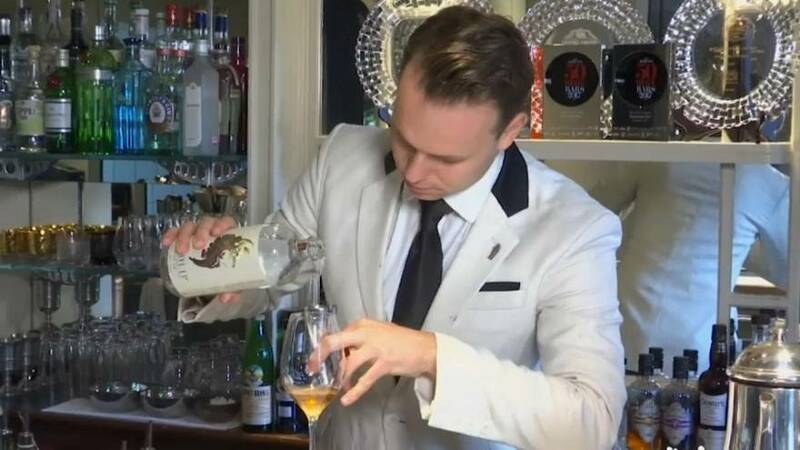 The bar is also responding to a new trend for non-alcoholic beverages as drinkers demand the same level of attention to detail without the intoxicating affect. Lorincz says they’ve crafted their own sodas and flavoured syrups, meaning barmen can mix up beverages with zero alcohol, but still lots of flavour. One example is this non-alcoholic ‘Art Deco’ cocktail. It contains eucalyptus and peppermint syrup. Opened in 1889, London’s Savoy Hotel and its American Bar is now owned by Fairmont Hotels and Resorts.